The benefits of spiders, particularly their appetite for pesky bugs, may be known, but when a spider crosses the floor people are quick to recoil and run. Even King David seemed to feel some level of antipathy toward spiders. 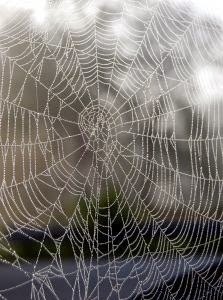 There is a beautiful Midrash, however, that reveals how the first King of Israel learned to appreciate arachnids. Master of the Universe,” said David, “what benefit do You have from...the spider, who spins all year long but whose product is unwearable?...The Holy One Blessed is He, replied, “There will come a time when you will need them.” When [David] was hiding from Saul in a cave, the Holy One, Blessed is He, sent a spider to spin a web across the entrance. Saul came, saw [the web] and thought, “Surely no man has entered here (Midrash Aleph Beis d’Ben Sira, Otzar HaMidrashim 47). This Midrash has an eternal message. One should never doubt the Divine plan of creation, and all creatures on earth have a reason and a purpose - even Itsy Bitsy Spiders. Appreciate the diversity of animal life on our planet. One of the arguments posed by those opposed to organized religion is that religion requires people to act mindlessly. Judaism, however, strongly encourages questioning, and “Free Will” is an essential element of Jewish philosophy and Jewish life values. More than that, while Jewish life is built around the collective history of the Jewish people, living Jewishly is meant to enhance the life of each individual. The emphasis on a person’s individual journey can be understood from the first of the Jewish patriarchs, Abraham. In Genesis 12, the words that God uses to instruct Abraham to journey to the Land of Canaan begin with the Hebrew phrase Lech Lecha. These two seemingly similar words are not related. The first word lech, is the imperative word “Go.” The second word is a possessive pronoun best defined as “For yourself.” God instructs Abraham that the path he is to take is one that is for himself. In other words, it is for his own spiritual development and enrichment. While this specific instruction was given to Abraham concerning his journey to the Promised Land, there is a well-known concept known among Jewish scholars that the actions of the fathers are a sign for the children. God’s command for Abraham to journey “for himself” is an imperative that echoes through the ages and calls upon each of Abraham’s descendants to embrace Jewish life for themselves. Explore Jewish life and embrace your heritage. A businessman, a Zionist, a refugee and a publisher, Salman Schocken lived a life driven by his passion for words. Born in Posen, Germany, on October 29, 1877, Schocken was the second son of a simple shopkeeper. A self-educated lover of culture and literature, Schocken spent his youth in Berlin but, at the age of 24, decided to join his brother, Simon, in business in Zwichau. Together, they founded the Schocken Department Store, which became a chain of 20 stores. Eventually, Schocken Department Stores was one of the most successful businesses in Germany. Salman became the sole owner after his brother’s unexpected death in a car accident in 1929. Schocken’s great passion for high culture and literature continued throughout his life. In 1915, he founded the monthly Der Jude magazine with Martin Buber In 1931, he created Schocken Verlag, a publishing house that focused on Judaism and published many important Hebrew works translated into German. When the Nazis came to power, however, Schocken was forced to sell his business enterprises to Merkur AG. (Post-war reparations were made for the loss of property to the Schocken family as recently as 2014.) Shortly thereafter, Schocken and his family moved to British-Mandate Palestine. Although he was an ardent Zionist, Schocken did not remain in the Holy Land, but moved to New York in 1940. During his time in Jerusalem, he built the Schocken Library, was a board member of the Hebrew University and established Schocken Publishing House, Ltd. He also purchased Haaretz newspaper, which was managed by his son Gerschom until 1990. Schocken’s love of literature led him, in 1945, to open the third incarnation of his publishing house, Schocken Books, Inc. with the aid of Hannah Arendt and Nahum Glatzer. Today it is an imprint of Knopf Doubleday Publishing Group at Random House. Salman Schocken died of a heart attack in Switzerland in August 1959. Next time you are purchasing books, add some Judaica to your bookshelves. One modern philosophy that might have caught your attention is conscientious living. This concept centers on increasing one’s awareness. In many ways, living according to Jewish law encourages conscientious living. For instance, one needs to be aware of the food one eats, both to insure that it is kosher and in order to make proper blessings. Another example is that awareness of the materials in one’s clothing is necessary in order to avoid wearing shatnez. This conscientiousness also includes being aware of the inherent holiness of certain items. The holiness of a Torah scroll is fairly obvious, but many other objects used for Jewish rituals also have an elevated status (tzitzit/tallit strings, Torah covers, etc.). Like holy books, these objects, when no longer useable, need to be disposed of appropriately (usually through burial or placement in a genizah). Such items are referred to as shaimot. Many people do not realize, however, that simple, seemingly mundane, items can also attain a level of holiness that requires extreme respect in handling them. This does not only refer to questions of disposal, but to the treatment of the items as well. For instance, these holy items should not be placed directly on the ground, have random things piled on top of them or be taken into the bathroom, as that demeans their sanctity. Any items on which God’s name is written/engraved in Hebrew is considered shaimot. There are, however, different opinions on whether this includes items on which God’s name is written in a different language. Items that contain verses of Torah, or Torah ideas written with the intent of holiness, may also be included in the category of shaimot. Because there are a variety of opinions on the specifics of shaimot, Jewish Treats recommends discussing specific items or questions with a rabbi. Be conscious of the texts you print out. Dressed in fancy clothes with silver buttons and a hat of golden fur, Rabbi Israel Friedman (1797-1850) of Rhuzin was a unique figure among the chassidic leaders. He surrounded himself with opulence in order to project the majesty of God on earth. According to accounts, however, Rabbi Friedman’s personal habits were extremely austere. He ate simple foods and slept little. One story even relays that his fancy boots were actually soleless. Born in the region of Kiev, Rabbi Friedman was the great-grandson of the Maggid of Mezritch, the successor of the founder of Chassidim, the Baal Shem Tov. His father, Sholom Shachne, the Rebbe of Prohobisht, died when Rabbi Friedman was 6 years old. Ten years later, after the death of his older brother, Rabbi Friedman became the leader of his father’s chassidim. After several moves, Rabbi Friedman settled in Rhuzin, where the numbers of his chasidim multiplied and he became known as the Rebbe of Rhuzin. The Rebbe’s large following and his opulent lifestyle led to the unfortunate attention of the Czar, who believed that Rabbi Friedman was trying to set himself up as a king for the Jews. Falsely accused of complicity in murder, he was imprisoned for 22 months. Shortly after his release, the Rebbe’s court moved to Kishinev and then escaped the Czar’s influence by moving to Austria, where his grand court was re-established in Sadigura. Although he lived in Austria, the Rhuziner Rebbe was very much involved with Jewish life in the Holy Land. In addition to sending his chassidim to emigrate, he instigated the building of the Tiferes Yisrael Synagogue in Jerusalem (also known as the Nissan Beck Synagogue, for its builder, who was a Rhuziner chassid). The synagogue was built on land near the Western Wall that the Czar intended to purchase for a church (which was built on the Russian Compound instead). The Tiferes Yisrael Synagogue was later destroyed by the Jordanians while the old city of Jerusalem was under their control. Rabbi Yisrael Friedman died on 3 Cheshvan, 1850. He and his wife Sarah had 10 children, many of whom went on to form their own chassidic courts. Do not judge a person's intentions by the way he/she is dressed. Jewish life ebbs and flows around the celebration of Shabbat. The days of the week are labelled by a count toward Shabbat (Sunday is Yom Rishon, the first day; Monday is Yom Shaynee, the second day, etc). Fast Days (other than Yom Kippur) are rescheduled so that the celebration of Shabbat will not be compromised by the sadness of the fast. Indeed, with the exception of the fast of the tenth of Tevet, even Friday fasts are rescheduled. Shabbat is referred to as a gift God gave the Jewish people from his treasure room (Talmud Shabbat 10b). The gift is far more than a day off from work, a day to rest. It is a day of working on one’s relationship with God. The fulfillment of a complete and total observance of Shabbat is a powerful key to redemption. On a personal level, the sages record that the proper observance of Shabbat is enough to negate even the sin of idol worship: “Rabbi Hiyya ben Abba said in Rabbi Johanan's name: He who observes the Sabbath according to its laws, even if he practices idolatry... is forgiven” (Talmud Shabbat 118b). Additionally, Shabbat is meant to be a day of enjoyment: “Rav Judah said in Rav's name: He who delights in the Sabbath is granted his heart's desires” (ibid). Shabbat is so powerful that it actually provides the key to salvation on a national level as well: “Rav Judah said in Rav's name: Had Israel kept the first Sabbath, no nation or tongue would have enjoyed dominion over them” (ibid). Indeed, the unified observance of Shabbat by all Jews remains the continual hope of the Jewish people, as “Rabbi Yochanan said in the name of Rabbi Shimon ben Yohai: If Israel were to keep two Sabbaths according to the laws thereof, they would be redeemed immediately”(ibid). Make the celebration of Shabbat a priority in your life. Challah, known to some as "Jewish bread," is one of the essential elements of the Shabbat table. Each of the three Shabbat meals begins with the blessing over two loaves of Challah, which are then cut and shared with all present. Bread has special significance in Judaism. It represents the great potential that God put in the world. Bread begins as a seed, grows into wheat (which is still inedible), is winnowed and ground before it is transformed into flour and then dough, which is then baked into bread. All this from a small kernel of wheat! Because of its stature as the “staple” food, the blessing over bread is recited at the beginning of the meal and "covers" all further foods eaten during the meal*. There is, however, special significance to the blessing of ha’mo’tzee (the bread blessing) when recited over two loaves at the Shabbat table. The two loaves serve as a reminder that in the wilderness God provided manna (the heavenly bread) every day except on Shabbat. Throughout the week, the Israelites collected only enough manna for a single day, but on Fridays they collected a double portion to last through Shabbat. The requirement to have two complete loaves is known as lechem mishneh (double bread). While the word challah brings to mind distinctive braided loaves, the shape is not a requirement. As long as the two loaves of bread are whole (they could even be two uncut rolls or two pieces of matzah), then the mitzvah of lechem mishneh is fulfilled. The braiding of the challah, however, has taken on symbolic significance. For instance, making the ha’mo’tzee blessing on two loaves of six-strand challah is a beautiful symbol of the unity of the Jewish people. Each challah strand is representative of one of the tribes of Israel. When the two loaves are held together, all twelve tribes are represented at the Shabbat table. *At a meal without kiddush at which one has eaten bread, a separate blessing is made on wine consumed during the meal. If one does not eat bread, separate blessings are recited on each of the items eaten, such as fruit, vegetables, grains etc. This Treat was originally posted on January 13, 2012. Try your hand at baking challah in your own kitchen (a wide variety of recipes are available online). Nowadays, nuts are often in the news. While packed with a nutritious punch, they are a source of great concern to those who may be allergic. Today, in honor of National Nut Day Jewish Treats presents Jewish thoughts on one of the most popular species of nut, almonds (sh’kaydeem in Hebrew). The better-known biblical reference to almonds, however, is in Numbers 17. After Korach the Levite staged an unsuccessful coup, Moses, following God’s command, placed the staffs of the princes of each tribe into the Tent of Testimony. As the prince of the Tribe of Levi, Aaron’s staff was included. The next morning, only Aaron’s staff had “put forth buds, and bloomed blossoms, and bore ripe almonds” (Numbers 17:23). This was a sign of Aaron’s worthiness to be the High Priest. Many commentators have delved into the specific significance of the fact that Aaron's staff grew almonds. One possible explanation is that the almonds created a definitive connection to the menorah of the Mishkan (Tabernacle), whose cups were decorated with the buds, blossoms and nuts of the almond tree. The lighting of the menorah was one of the daily responsibilities of the High Priest. The blessing over tree nuts is the same as that over fruits (Ha'etz). “And six years you shall sow your land, and gather in the increase thereof; but the seventh year you shall let it rest and lie fallow, that the poor of your people may eat; and what they leave the beast of the field shall eat. In like manner you shall deal with your vineyard, and with your olive-yard” (Exodus 23:10-11). While agricultural experts have long praised the policy of letting agricultural fields have periods of rest and regeneration, the halachot (laws) of the shmittah year apply only to Jewish owned fields in the land of Israel. During shmittah, Jewish farmers who abstain from working their fields demonstrate great faith, trusting in God's promise of abundance to supply them with food during the shmittah year and the year that follows. “And if you shall say: 'What shall we eat the seventh year? Behold, we may not sow, nor gather in our increase'; then I will command My blessing upon you in the sixth year, and it shall bring forth produce for the three years. And you shall sow the eighth year, and eat of the produce, the old store; until the ninth year, until her produce come in, you shall eat the old store” (Exodus 25:20-22). If you visit Israel, be aware that the laws of shmittah are in effect for this year. Organized recycling is a development of the modern world, and from the current understanding of the concept, is not discussed in the Talmud. After all, in the era when the sages were compiling the Oral Law, most people lived in an agrarian society that naturally reused many of its own byproducts. Upon further exploration, however, the Talmud reveals a religious version of recycling. When Rabbi Ammi and Rabbi Assi happened to get hold of a loaf of bread that had been used for an eiruv (perimeter creating a private area in which one would be allowed to carry on Shabbat), they used to say over it the blessing, ‘who brings forth bread from the earth,’ saying, since one religious duty has been performed with it, let us perform with it still another (Berachot 39b). 1) The etrog (citron), one of the four species of Sukkot, is used by many to produce post-holiday delicacies such as etrog jam. Others use the citron fruit for besamim (spices for havdallah after Shabbat), often sticking cloves into the rind to enhance the scent. 2) The lulav (the palm branch of the four species of Sukkot) is set aside to dry. The dried lulav is then used as tinder to start the fire in which chametz (leaven) is burned before Passover. 3) After Passover, when no one has any desire to eat more matzah, the left over matzah is set aside to be eaten on Pesach Shaynee. 4) Every Shabbat, the mot’zee blessing over the challahs serves as a means of sanctifying the day. Left over challah is often used to feed the birds or to make bread crumbs. This Treat was last posted on April 24, 2012. Take proper care of the items you use for religious purposes. On the night of Simchat Torah (which is the second night of the holiday outside of the land of Israel), all the Torah scrolls are removed from the ark. The bimah (platform or table on which Torah is read) is circled seven times by those holding the Torah scrolls with the congregation dancing joyously with them. Each encirclement, called hakafa, begins with a responsive prayer. During the morning service, all the Torahs are again taken from the ark, and the hakafot, the joyous circling of the night before, are repeated. The final parasha (weekly portion) of the Torah, V’zot Ha’bracha (And this is the blessing...) is read. The final parasha is read over and over until everyone has been called to the Torah. In some congregations, several Torah readings take place simultaneously. *This Treat was last posted on Monday, October 5, 2012. This cute ditty must have been written in a northern country–someplace like England–where they have the luxury of wishing rain away. In Israel, however, for the last few years, environmentalists have gathered to observe the shrinking of the Sea of Galilee (a.k.a. Kineret) as a result of a lengthy drought. Of course, agriculture played a much more prominent role in people's lives during the Talmudic period. Yet, even in the industrialized society of Israel today there is a constant fear of drought. And since the Land of Israel is an integral part of our Jewish heritage, our daily prayers reflect the need for rain. From the end of the holiday of Sukkot until the beginning of the holiday of Passover, a small prayer is added to the second blessing of the Amidah (silent prayer) addressing God as: “Mashiv ha'ruach u'morid ha'geshem, Who causes the wind to blow, and the rain to fall.” In this way, Jews throughout the world pray that the rains should fall in their proper season. This Treat was last posted on November 12, 2009. During Sukkot, there is a mitzvah to wave the four species (lulav, hadassim, aravot and etrog - palm, myrtle, willow and citron) every day except on Shabbat. In addition to this mitzvah, the four species are grasped together while special prayers are recited as congregants march around the Bimah (central platform) of the synagogue during the daily Sukkot Hoshanot service and during Hallel (with the exception of Shabbat). On the seventh and final day of Sukkot, the day known as Hoshana Rabbah, there is an additional ceremony performed known as the Beating of the Willows. The history of this mitzvah is less clear than the other mitzvot of Sukkot, but its performance is described in the Talmud (Tractate Sukkot 44a). Actually, it is written therein that "the [beating of] the willow branch and the water libation [ceremony] were given to Moses at Mount Sinai.” The fact that the ceremony continued after the destruction of the Temple and outside the land of Israel is considered to be of Prophetic origin. The performance of the seven hakafot (circles around the bimah) and the beating of the willows is universal, whether one is Ashkenazi or Sephardi - although there are different customs as to when in the service they are performed. Following the hakafot of the hoshanot, a bundle (although a single branch may be used) of willow branches* is taken and beaten five times on the floor. Because the origins of this ceremony are so cryptic, the meaning of beating the willow branches is the source of great conjecture, ranging from a connection to the Sukkot prayers for rain to an association with humility. *The bunch of willow branches is also referred to as hoshanot. This Treat was last posted on September 24, 2013. Rosh Hashana is known as the Day of Judgment (Yom Hadin), the day on which God judges the world. Yom Kippur, the Day of Atonement, is the day on which God finalizes His verdict on the judgments of Rosh Hashana. But actually the days of judgment are not quite over. According to tradition, as stated in the Zohar (3:31b): "This [Hoshana Rabbah] is the final day of judgment for water, source of all blessings. On the seventh day of Sukkot the judgment of the world is finalized and the edicts are sent forth from the King." The days of judgment are not, it seems, truly over until the seventh day of Sukkot, which is why the tashlich ceremony may be performed until Hoshana Rabbah. What is the connection? On Rosh Hashana, God determines the fate and fortune of both individuals and communities for the year to come, including exactly how much one will earn in the coming year. Material endowments are one form of sustenance. On the holiday of Sukkot, however, God determines the world’s water allotment for the year to come. Since God is still sitting in His heavenly courtroom deciding the fate of the world, there is time to slip in a final appeal or to do an extra act of kindness in the hope of altering the scales of justice in one’s favor. On Hoshana Rabba, extra hakafot (circles around the bimah) are added to the service, as well as the beating of the willows). In some communities, it is customary to stay up all night studying Torah. Additionally, many people eat a light, festive meal in the afternoon. Hoshana Rabbah 5775 begins tonight. This Treat was last posted on September 24, 2012. Prepare for Hoshana Rabbah by obtaining fresh willow branches. Why does Rashi specify "so that rain shall fall all over the world"? Rain is the ultimate sign of blessing (when it falls in a timely manner and in proper proportion). Without rain nothing can live. Additionally, when all nations are sufficiently endowed with their needs (water, food, etc.) peace prevails, and peace is the greatest blessing of all. This Treat was originally published on September 27, 2012. This Treat was last posted on September 22, 2013. See the positive in a rain storm. The fruit of a "beautiful tree" (etrog) has both taste and scent, and is symbolic of those Jews who are well-versed in Torah and who have performed many good deeds. The branch of the palm tree (lulav) has taste but no scent, and is symbolic of those Jews who are well-versed in Torah but have not performed good deeds. The boughs of myrtle (hadassim) have scent but no taste, and are symbolic of those Jews who have performed many good deeds, but have not studied Torah. The willows of the stream (aravot) have no taste and no scent, and are symbolic of those Jews who have neither studied Torah nor performed good deeds. When the four species are brought together, they represent the complete spectrum of the Jewish people. Acknowledging our different strengths and weaknesses is critical not only in creating harmony among people, but in creating a unified nation. Creating a unified nation represents the ideal state of the Jewish people. It was in a state of true unity that the Jewish people camped at Mount Sinai to receive the Torah, and it can only be as a unified whole that we can reach our full potential once again. 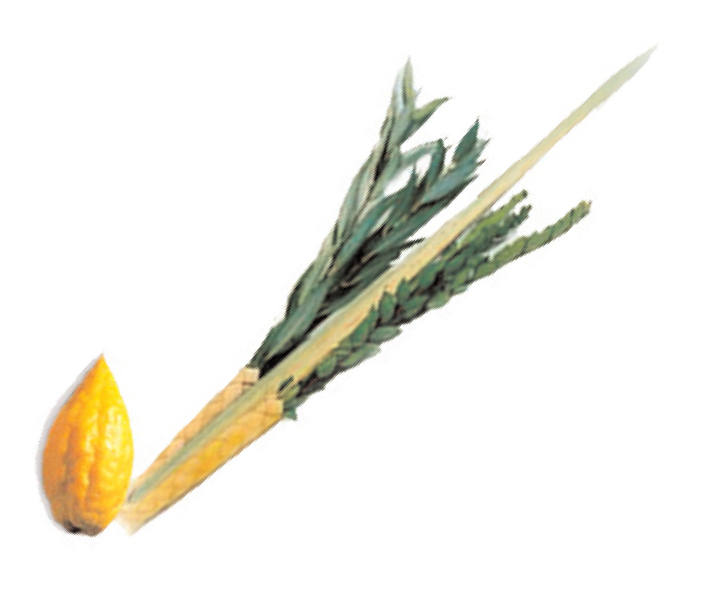 For more information on the four species (lulav and etrog) of Sukkot, click here. This Treat was last posted on September 23, 2013. Few people refer to Sukkot by the name Chag Ha'Asif, Feast of the Ingathering, but the Torah specifically states: "And you shall observe...the Feast of Ingathering at the turn of the year" (Exodus 34:22). Perhaps this term is avoided lest the holiday be mistaken as a simple agricultural celebration. But, Sukkot is indeed an agricultural festival celebrated at the time of the harvest, when farmers bring in the fruits of their labor, and everyone prepares for the onset of winter. There is no question that, as a result of witnessing the miracle of harvest in the field, people are moved to be thankful to the Creator of all things. Sukkot, however, is more than a harvest festival, because it isn’t actually about the crop. It is a festival meant to help Jews focus on the Source of those crops. This is why Jews move out of their comfortable homes and into their temporary dwellings (the sukkah) just as the weather grows chilly. It is a striking reminder that there is a more powerful Force in charge of one’s success. One can plant and sow and fertilize at all the right times, but one can only reap if God provides all of the right natural factors (good soil, proper amounts of rain at the right time, the farmer’s health, etc.). While we today may not live in agricultural settings, that does not mean that we are not constantly dependent on a force greater than ourselves. No matter what profession one practices, one’s success is affected by thousands of different factors each day. While we may not personally gather our crops, we must always celebrate and be grateful for, and aware of, the Source of our sustenance. Remember that the mitzvot of dwelling in a sukkah and taking the four species continues this week. Walk into a traditional synagogue in the middle of morning services during the week of Sukkot and you might have to take precaution not to be trampled upon by the circle of attendees walking around the bimah (central table where the Torah is read) holding their lulavim. The Hoshanot service has been part of the celebration of Sukkot since the days of the Holy Temple, when, according to the Mishna: “It was customary to make one procession around the altar on each day of Sukkot, and seven on the seventh day” (Sukkot 4:5). The name of the service, Hoshana, is derived from the opening word that is repeated throughout the first prayer: Hoshana. This word is actually a contraction of two separate words and means “Please save!” The congregants open the ceremony by beseeching God to save His people “For Your sake, Our God!”; “For Your sake, our Creator!”; “For Your sake, our Redeemer!”; and “For Your sake, our Attender!” Each cry is preceded and followed by “Hoshana” (Please Save!). The Treat was last posted on September 18, 2013. "To everything - turn, turn, turn/There is a season - turn, turn, turn/And a time for every purpose under heaven." Kohelet is one of the five megillot (scrolls) read on the different Jewish holidays (for a complete list, click here). Kohelet is read on Shabbat Chol Hamoed (intermediary days) of Sukkot. The scroll begins: "The words of Kohelet, the son of David, king in Jerusalem," and thus the name of the book. As King David had no son named Kohelet, the author has traditionally been identified as King David’s heir, King Solomon. If there is one thread that binds the twelve chapters of Kohelet together, it is the phrase: "Vanity of vanities, all is vanity" (1:2). On the surface, this seems to be a rather depressing thought. However, that is not the message of Kohelet. It is the nature of humankind to not only take pride in one’s success, but to also take full credit for it. Certainly, people succeed as a result of their hard work, but only because this success is enabled by Divine Providence. The message of Kohelet is perhaps best summed up in the following verses: "I have seen the task which God has given to the sons of men to be exercised. He has made everything beautiful in its time;... man cannot find out the work that God has done from the beginning even to the end....But also that every man should eat and drink, and enjoy pleasure for all his labor, is the gift of God" (3:10-13). This too is one of the central ideas of Sukkot. Moving into a temporary dwelling emphasizes that the success of every person is, ultimately, in the hands of the Divine. This Treat was last posted on September 18, 2013. Remember that Sukkot is Z'man Simchataynu, the time of our rejoicing, and have a very happy holiday. At this time of the year, Jews around the globe head out in search of the perfect lulav and etrog (Lulav refers to the grouping of lulav, hadassim and aravot, which, together with the etrog are referred to as the four species.) Since the lulav and etrog are used for the mitzvah of waving the four species, it’s important to find a set that is as perfect as can be. 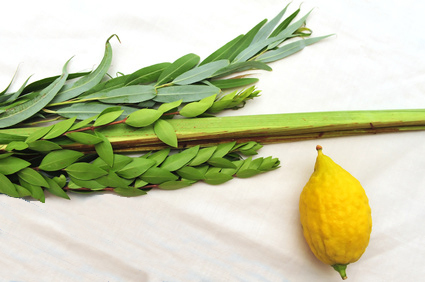 So what makes a lulav and etrog “perfect”? Lulav/Branch of a Palm Tree: A lulav is actually the closed frond of a date palm tree. A nice lulav is green, with no signs of dryness. It should be straight, without any bends or twists near the top. The tip and top leaves of the lulav must be whole, and not split. It is placed in the center of the hadassim and the aravot with its spine facing inward. Hadassim/Three Myrtle Branches: The hadassim, which are bound on the right side of the lulav, should have moist, green leaves grouped in level rows of three. There should be no large, uncovered section of stem. The stem and the leaves should be whole, without any nips at the top and the leaves should cover the entire branch to the top. There should not be more berries than leaves and there should be no large twigs. Aravot/Two Willow Branches: The aravot, which are bound to the left side of the lulav (slightly lower than the hadassim) should have reddish stems with green, moist leaves. The leaves should be long, narrow and smooth-edged, with no nips or tears. This Treat was originally posted on September 16, 2013. The waving of the four species is one of the most beautiful and symbolic mitzvot of the year. Indeed, there is a special commandment (Leviticus 23:40) that one make a specific effort to enhance and beautify this mitzvah. Ba’ruch Ah’tah Ah’doh’nai, Eh’lo’hay’nu Melech Ha’o’lam, ah’sher kidishanu b'mitz’vo’tav v'tzee’va’nu al n'tee’laht lulav. Blessed are you, Lord our God, Ruler of the world, who sanctified us through His commandments and commanded us to take the four species. Waving the four species is a symbolic recognition of God’s omnipresent kingship over the world and everything in it. As it says in the Talmud, in Sukkah 37b: "It is as if one is taking the species and bringing them to God who possesses the four directions. One raises them and lowers them to God who owns the heavens and the earth." Acknowledging God’s ownership of the world is particularly appropriate during the harvest season, when people might be tempted to rejoice exclusively about their own personal success. Surely, people are entitled to celebrate their own achievements, but always with the understanding that behind it all is God. This Treat was last posted on September 16, 2013. Call your local Jewish bookstore or rabbi to inquire about getting a set of lulav and etrog. During the holiday of Sukkot, Jews live in sukkot (temporary dwellings with a roof of branches or wooden boards) for seven days. Although the bare minimum required for a kosher sukkah is a few walls and a roof of branches through which one can see the stars, there is, as with all Jewish rituals, the practice of hiddur mitzvah, beautifying the mitzvah. There are several ways in which one might beautify one’s sukkah. The simplest beautification, of course, is using quality materials in building the sukkah and setting a beautiful table therein for the holiday meals. The more elaborate means of beautifying a sukkah, however, is through attractive decorations. Some might think that decorating a sukkah is child’s play. Paper chains and school art projects are often the mainstay of a family’s sukkah. But, the adornment of the sukkah can be far more sophisticated. In the oldest records of Jewish life, the sages took for granted that a sukkah will be decorated: “...with embroidered hangings and sheets, and hung therein nuts, almonds, peaches, pomegranates, bunches of grapes, wreaths of ears of corn, [vials of] wine, oil or fine flour...” (Sukkah 10a). The specific decorations noted by the sages all celebrate the bounty of the harvest season, which is appropriate as Sukkot is also referred to as Chag Ha’asif (the holiday of the ingathering of the harvest). The choice of sukkah decorations is often a reflection of one’s heritage. Persian Jews traditionally adorned their sukkot with Persian rugs. Jews who follow the Judeo-Spanish heritage might continue the custom of hanging bisochos, sweet, sesame seed-covered cookie rings. The most common decorations, however, remain agricultural in nature and often feature the seven species for which God praises the Land of Israel: wheat and barley (often hung in glass jars), grapes, figs, pomegranates, olives and dates. This Treat was last posted on September 30, 2012. Decorate your sukkah in a way that expresses who you are. During the festival of Sukkot, the sukkah is intended to be our home. For example, since one would normally dine in the house, on Sukkot one dines in the sukkah. Because the sukkah is temporary, however, moving into the sukkah requires leaving behind some of our material comforts, settling for rather basic necessities, thus creating a more spiritual environment. In our spiritually enhanced “mini-homes,” the Jewish tradition of hospitality and inviting guests takes on an entirely new dimension! Not only do we invite friends and neighbors to join us, but there is also the custom of inviting the great historic Jewish personages who shaped our people. This custom is known as Ushpeezin (the Aramaic word for guests). According to the kabbalah, the Jewish mystical tradition, the Divine Presence (Shechina) accompanies every Jew into the sukkah. The Shechina is accompanied by the seven shepherds of Israel: Abraham, Isaac, Jacob, Moses, Aaron, Joseph, and David. Each night, another one of the ushpeezin is welcomed, in a specific order. Thus on the second night, one says: "May it please you, Isaac, my exalted..." On the third night: "May it please you, Jacob, my exalted..." and so on throughout the week. *The order of the Ushpeezin may vary depending on community. This Treat was last published on September 30, 2012. It is time to celebrate! Just five days after Yom Kippur, the festival of Sukkot begins. On this most festive of holidays (it is known as "Z’man Simchataynu," the time of our rejoicing), Jews live in temporary dwellings called sukkot (singular - sukkah) with a roof of branches or wooden boards. This temporary "hut" becomes the Jew’s home for seven days, and, therefore (weather permitting), everything that we would do in our homes, such as eat, sleep or study, is done in the sukkah. The sukkot are a reminder of our origins, of our wandering in the wilderness after being redeemed from slavery. In fact, this reminder is both of the physical state in which we lived and the spiritual environment in which we sojourned. Symbolically, the sukkah represents the Ananei HaKavod, the Clouds of Glory, in which God enveloped and protected the wandering nation after the Exodus from Egypt. A strange holiday? Perhaps, but by moving out of our permanent domiciles, especially at the beginning of the rainy/cold season, we demonstrate our faith in God as the provider and sustainer of all life. So if you thought you had nothing to do next week, take a look around and find the nearest sukkah in which to dwell. Or, of course, you can always build your own! This Treat was last posted on September 15, 2013. Webster's Dictionary defines a tabernacle as a temporary dwelling, which is why the Jewish holiday of Sukkot is known as the Feast of the Tabernacles. A sukkah, however, is a lot more specific than simply a temporary dwelling--which is often taken to mean something like a tent or a recreational vehicle. THE WALLS of the sukkah may be made out of any material--wood, plastic, even canvas--as long as they can withstand normal gusts of wind without swaying noticeably. A sukkah must have a minimum of 2 ½ walls and have a doorway. The sukkah walls may actually be walls from a pre-existing structure. The sages set the minimum length and width of a sukkah at seven handbreadths (approx 28") and the minimum height at 10 handbreadths (approx 40") tall. The maximum height is 20 amot (approx 30’). THE ROOF of the sukkah, known as s’chach, is a critical factor in determining the sukkah’s halachic acceptability. S’chach is defined as anything of plant origin that is now detached from the ground but has not undergone any manufacturing process nor had a previous use (such as a wooden post designed to hold up a sapling) nor may it be edible. Additionally, the s’chach pieces should be less than four handbreadths wide. For the sukkah to be "kosher," there must be enough s’chach so that there is more shadow than sunlight. It should not, however, be so dense that one is unable to see the larger stars at night or that the rain cannot penetrate. PLACEMENT of the sukkah is important because to meet the s’chach requirements, the area above the sukkah must be clear (no building overhangs or branches from a tree). The holiday of Sukkot begins this Wednesday night at sunset.